Comparing my natural sole with a manufactured barefoot sole. Okay, so I have been doing some research. Essentially I live in a very hot part of Australia, (Perth) and summer is going to be rather hot. Last year I actually had melting tar stick to my feet. Also I love trail running and am keen to continue this barefoot. However as in all things one needs to be sensible and run on trails that can be done. I do not want to shred my feet! So I thought I would research the “barefoot shoe” market and see what was available. Very interesting issue. The Manufactured “barefoot” sole really surprised me in the claim that it closely related to the barefoot feel and provenance. Oh – and added perfromance enhancement? Please continue to scroll down and follow this research, I do believe it will make you think! 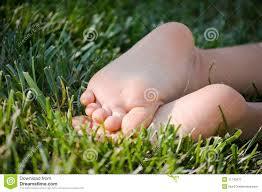 This is a picture of baby barefoot soles courtesy of Google Images. the Interesting point here is that these are very smooth pink little feet with cute toes and a slight pale foot arch. No special grip or callus pads, but the very foot in its rawest form. 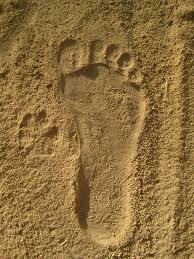 This is a google image picture of a footprint in the sand, clearly unrelated to the smooth soles baby foot above. Notice how smooth the base of the impression is? A fully formed adult foot (flat footed to by the looks of it) Actually this might even be an Inov8 footprint? 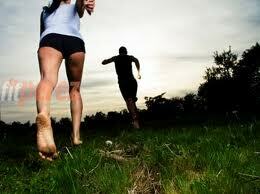 Now this is a random Google image of another female barefoot runner. Notice her natural foot. okay – so I think you are all getting the point I am making as to the shape and slip resistance of any foot, the many features of the appendage at the base of our legs that enhances our active mobility as an upright human. Now to look at the barefoot shoe sole. Please kindly take note of the special features proudly highlighted on these various shoe soles of “optimised” barefoot running – to enhance the barefoot experience – “to bring the barefoot experience to the wearer” and so on. See the extra grip features in each of these? Funny I never saw that on any of the above natural bare feet. See the additional re-enforced sole pads of thicker material for added comfort/protection or other hype? The additional ribbing for traction and turning? The deeper spike ridging for grip and protection? Not sure what happened, but these features are not on my feet! Now do not get me wrong, when running, especially with wrinkly wet feet on the roads, and you turn a sharp turn about, one would certainly appreciate the option of optimised comfort grip super traction ribbing on the forefoot outer edge (foot sole below the baby toe).. But all is not lost. I like to run on the beach and sand dunes, and return back via the trail and road, but it is a good 25km stretch, and if my feet have been wet and I hit hot rock or burning hot sand, I may find myself in a spot of bother. I was looking for some thing a little more suitable that can really mimic the ability of the raw foot and yet afford me that small comfort barrier to reduce the direct connection of my precious sensitive skin with mother nature. I have my New Balance Vibrams, but they fill with sand on the beach, and of course get wet in the sea, which made me think of looking more for a second skin imitation rather than an engineered and sophisticated performance enhancing platform. And I found Inov8 Evoskin shoes. For some reason they do not appear readily on the market and looks like they have not been a marketing hit. I have a pair coming over from the UK, so cannot wait to give them a try. Now lets look at these and see how they compare with the foot! Not overly excited about the toe separation going on – not my style, but will not knock it until I have tried it! High pressure point of my sole on the forefoot. The plaster shows a good guide of where my feet land when running and clearly highlights the working zones of my ground strike.